Which are the best pillows for neck pain? Am I using the right pillow? This is the first question that jumps up in the mind after one wakes up with neck pain on a few consecutive mornings. Hopefully, we can help. Read on to learn answers to common questions users ask after the initial one. Later, we’ll check out some of the best pillows for cervical pain. What’s the most important factor to consider when buying a pillow for neck pain? Your sleeping position, but of course. The position of the head and the neck is different in different sleeping positions. Naturally then, a pillow that works best in one sleep position might not work as well in another. Back sleepers must keep three things in mind. One, the pillow should support the natural curvature of the spine and provide ample support to their head, neck, and shoulders. Second, the height of the pillow shouldn’t be too much (If your head tilts forward, it means that the height of your pillow is more than necessary.). Third, keep a pillow or two underneath your knees as it helps ameliorate back and neck pain. Side sleepers need a thicker pillow than back sleepers to maintain a straight spine during sleep. You might want to consider a side pillow that is thicker under the neck than the head, as it helps keep the spine in a natural horizontal line better. You can also try out placing a rolled up towel or a soft, small pillow under your waist. Some people find they get better support this way, so it’s worth trying out for a few days at least. This is the least preferred sleep position, especially if you’ve neck or back pain. But if you can’t sleep in any other position, placing a flat pillow under your stomach is strongly recommended. It will help maintain the natural alignment of the spine. A pillow under the head is optional for stomach sleepers. If you need one, opt for a flatter variety, because the flatter the pillow, the less misaligned your head and neck. I sleep on my stomach and have a neck pain on most mornings. Should I change my sleeping position? When you sleep on your stomach, your head is always completely turned to a side (it can’t be otherwise because then how will you breathe), putting your head and spine out of alignment, which in turn twists your neck, causing neck problems over time or worsening current neck pain. So the answer is, yes, you should try changing the sleeping position. However, changing your natural sleep position is anything but easy. It may take weeks or months, and even then it may not happen. Also, remember we often switch positions during sleep, and there’s just no way to prevent body from going back to the old sleeping position. What, however, is more doable is starting off in a right position, that is, on your back or side. Start the night sleeping on the side or back and see it how it goes from there. If you wake up in night and find yourself lying on the stomach, roll back to lie face upwards or on your side. With practice, you might just well succeed in retraining your body to sleep in a healthier position. Does quality of sleep matter too? Yes, it does. And research proves this. In a study, researchers found that the quality of sleep affects musculoskeletal pain, including shoulder and neck pain. Researchers studied four thousand and one hundred forty participants for over a year, with some participants having sleeping problems while others not. Sleeping problems were defined in four categories: trouble falling sleeping, difficulty staying in sleep, non-restorative sleep, and waking up earlier than normal. Participants with three or all types of sleep problems were found to be significantly more likely to develop musculoskeletal pain after twelve months than those with no sleep problem. The most plausible explanation for the finding is that muscles are not able to relax and heal properly, leading to musculoskeletal pain, when sleep is poor. Another thing is that pain itself makes falling and staying asleep difficult. It is a vicious circle, where one feeds another and also feeds off it. What are the most popular types of pillows for neck pain? Orthopedic Pillows – As they help maintain the natural curve of the neck, they are considered beneficial to neck pain patients. Feather Pillows – These are soft and moldable, and so are suitable in neck pain (but not if you are asthmatic or prone to allergies). Memory Foam Pillows – They cradle your head and neck well and also reduce those pressure points. Most of them, however, do smell, at least when new, but the good thing is that they are naturally hypoallergenic and dust mite resistant. Water Pillows – They support the neck by absorbing and redistributing weight. A major advantage is that you can customize the support by increasing or decreasing the water content. These pillows, however, don’t come cheap. Buckwheat Pillows – Moldable, durable, and airy are some adjectives synonym with buckwheat pillows. That said, these pillows are a little on the firm side. If you’ve always used a soft pillow till now, you might take some time to get used it. This is a firm pillow, but it’s not hard. You might want to consider it if your doctor has recommended you a firm pillow. One big advantage of the Tri-Core Pillow is its two different firmness levels. And thanks to its trapezoid centre, it cradles and supports the head in its natural position well. This pillow also features side wings for side sleepers, which are thick and firm enough to keep your head at a good height and provide good support to it. As the pillow is available in three sizes, you shouldn’t have any difficulty in finding the right size. A warranty, however, is missing, and so is an extra cover although any regular cover is likely to fit it well. Getting used to the Tri-Core Pillow may take some time. So don’t throw away your old pillow the moment you receive it (Otherwise, you may find yourself tossing and turning for first few nights.). First thing first: if you are seeing this pillow for the first time, you will find its shape odd. Writing it off on basis of that, however, might be a mistake, because it does offer some useful features. The Therapeutica Sleeping Pillow is basically two pillows in one. It supports back and side sleeping and also offers a different height for each. The side wings are for side sleeping and the central cavity for back sleeping. Both of them feature a contoured surface for better support. The pillow comes with a special cervical contour, just below the center cavity, which aptly supports C7 and the area between your shoulder blades. Another highlight is the included wedge extension, a unique feature not found in other pillows, which provides support for the upper back. Available in three sizes, small, medium, and large, the Therapeutica Sleeping Pillow comes with a 5-year warranty against losing shape and resilience. All in all, you might want to consider this pillow if you’ve neck pain. It is, however, not suitable for someone with an immobile neck or reversed cervical curve. The special V shape serves two purposes—traction and cervical support. A gentle stretch on the cervical area is felt when you sleep on the traction side. The stretch is supposed to relive pain and stiffness in the neck and also keep the neck in right position. The support side, on the other hand, proves effective in keeping the neck properly aligned with back. The Arc4Life Cervical Pillow is not only for back sleepers. Those who sleep on the side will find the side wings useful, which keep your head at the right height above the mattress, neither not too low nor too high. I have only two gripes with the Arc4life Pillow. One, a warranty is missing. Two, there is no dust cover or extra pillow cover. The pillow features two lofts, making it suitable for use for both back and side sleepers. The higher loft is for sleeping on the side while the lower loft for back sleepers. Memory foam pillows are naturally soft, which can be a disadvantage when you have neck pain. However the Sleep Innovations Pillow is quite firm, thanks to its 3 pound thickness, and provides good support to the head and neck. 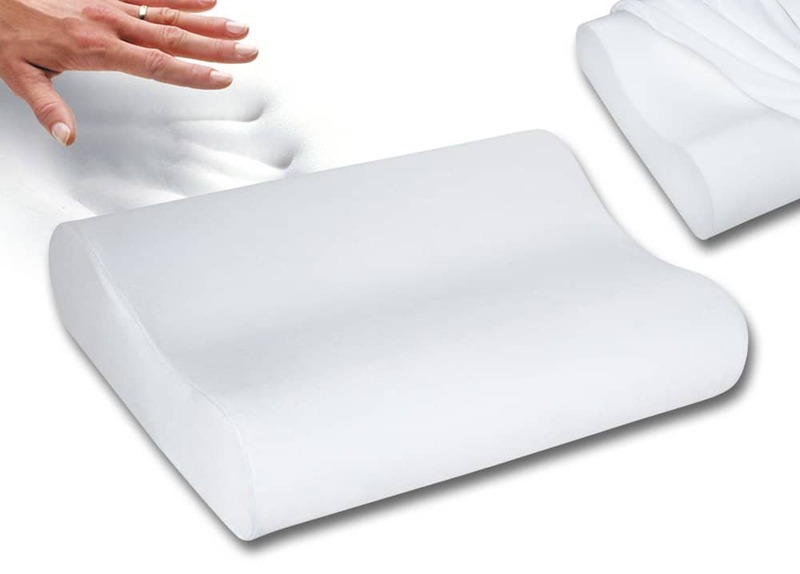 The pillow uses the open cell technology, which basically makes the foam more breathable. You are not likely to feel hot under the head even when the temperature is on the higher side. Memory foam pillows are naturally dust mite resistant, and this pillow is no different. You will not have to worry about it worsening your asthma or triggering an allergic reaction should you use it. The pillow, however, smells—there is no escape from it. Let it air out for a day or two when you un-wrap it. If the smell is still an issue, throw it in the machine with a healthy amount of a strong smelling detergent. Mediflow has used hypoallergenic polyester filling in the top layer, which is comfortable. The pillow cover is 100% cotton, so you don’t have to worry about it getting warm under your head. Another advantage is that the pillow doesn’t produce any audible sound when you toss and turn. So basically it is as noise-free as other types of pillow. The Mediflow Waterbase Pillow is made in the USA. This is definitely a plus for those who do not prefer made outside the country. It’s good for sleeping but you wouldn’t want to use it to support your back as you read because it does become heavy after adding water. Moving it while lying on it is a little difficult also because of the same reason.